With the similarity in the numbering (the original Dumbarton Oaks draft called this “Chapter” 2 giving an even closer resemblance) it is tempting to think that the connection between the UNC and Isaiah was there from the UN’s inception. There is also a statue in the UN garden named “Let Us Beat Our Swords into Plowshares”. Wikipedia even finds it necessary to inform us that, contrary to popular belief, these words from Isaiah are not in fact inscribed on the UN building’s foundation stone. Those words are actually engraved on a wall across the road. However, the wall with the words from Isaiah is not part of the UN complex. It was built in 1948 alongside some steps leading up to a housing development across the road from the site of the UN building, and the inscription was only added in September 1975 when the park was dedicated to Ralph Bunche. The quote was engraved without an attribution, a fact which so incensed one New York citizen that he lobbied the office of the mayor for ten years to have the word “Isaiah” added to it. His wish was duly granted by Ed Koch in 1985 and it is now known as the “Isaiah Wall”. Here it should be pointed out that the quote is also reproduced verbatim in another book of the Bible – that of the minor prophet Micah (4:3) – but for reasons to be examined further on there is a desire to link notions of progressive world government to Isaiah, rather than to other prophets. The link with Bunche was simply that this was his favourite quote – according to Sir Brian Urquhart’s biography of Bunche, he used it in a university debate as early as 1926. Bunche was part of the team that drafted the Charter but he was mainly involved in the sections on non self-governing territories and had no hand in Article 2(4). The statue has a much stranger history. It is well known that it was donated to the UN by the Soviet Government in 1959, but it was originally displayed at the 1958 World’s Fair in Brussels (“Expo 58”). Expo 58 was the first World’s Fair after World War II and comes lavishly coloured with Cold War intrigue. The US and the USSR were given the two biggest pavilions on adjoining lots so as to give visitors the maximum chance of comparing what their rival world views had to offer. The theme of the Expo was “for a more humane world” and addressed fears of superpower rivalry leading to nuclear war by putting the “atoms for peace” agenda centre stage. 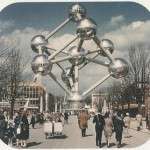 It had as its symbol the Atomium: an atom which came to life as a the centrepiece of the park, several stories high, serving as an educational exhibit for the peaceful uses of atomic energy and a highly visible reference point for visitors to get their bearings. 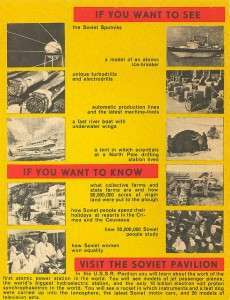 Naturally the US and the USSR spied on each other’s planned exhibits. The Americans planned to overcome Europeans’ negative impressions of capitalism, and racism in America by demonstrating the superiority of American values, rather than just showing off consumer goods. The Soviet Union was unsure whether to counter this propaganda on its own terms or to try and show off its scientific and consumer advances. So it decided to do both. The Soviet brochure boasted a bizarre inventory of exhibits including a nuclear-powered ice-breaking ship, “the only 10 billion volt proton synchrophasotron in the world” , “the latest Soviet motor cars”, “26 models of television sets”, and, representing the one area where they undeniably held a lead over the US, the Sputnik orbiter. A competition was held to design the pavilion and its statuary. Among the 100 designs for statues submitted was one called “Swords into Ploughshares” by Evgeny Vuchetich. That statue was chosen, was awarded a Grand Prix by the Expo organizers, and was then donated to the UN the following year along with some Sputnik replicas. 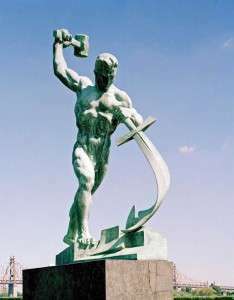 The UN archives do not record whether the Soviets knew or approved of the Biblical origins of the phrase or how the name of the statue developed two different yet very telling prefixes: the official name in the UN’s art inventory lists it as “Let Us Beat Our Swords into Plowshares” whilst the statue’s plinth bears the phrase “We Shall Beat Our Swords into Plowshares”. A replica of the statue in Moscow’s Peace Park has no name or quote engraved on it at all. In his written remarks for the ceremony accepting the Soviet’s gifts in 1959, UN Secretary General Dag Hammarskjold said “The ancient dream of mankind, reflected in the words of Isaiah…is the dream inspiring also the Charter” but this was 14 years after the organization was founded. While there is no evidence of Isaiah’s influence in the travaux of the Charter, we could trace a line through various texts leading up to the UN Charter which gradually crystallizes the uncompromising ban on the use of force found in Isaiah: the Bryan Treaties’ cooling off period, the League of Nations Covenant only permitting the use of force to settle disputes if other methods failed, the ban on aggressive war in the Kellogg-Briand Pact of 1928 and finally the Atlantic Charter of 1941. The latter seems to come closest to demonstrating a religious inspiration for the ban on the use of force in the eighth paragraph of the final draft: “they believe that all of the nations of the world, for realistic as well as spiritual reasons must come to the abandonment of the use of force”. In that reference to “spiritual reasons” we hear Isaiah’s echo most clearly from the mouths of statesmen, but that is as close as we can get to any sign of pre-meditation. As exemplified by the Isaiah Wall, and Hammarskjold’s comments in 1959, explicit references to Isaiah only developed after the UN’s founding as the UN started to develop a sense of its place in world history. There is comfort in seeing evidence of modern concerns arising in ancient contexts – knowing that good people yearned for an end to war 27 centuries ago can be simultaneously a reassuring continuity and an indictment on our inability ever to learn peaceful ways. We look for signs of progress. Even by Isaiah’s time there was hope that violence in society had begun to be tamed by law: from Lamech’s killing someone merely for striking him (Genesis 4:23), to the Flood which was sent because “the earth was full of violence” (Genesis 6:11), to proportionate, legalistic punishments set out in Exodus 21, and limitations on blood revenge in Numbers 35, we could read a progress narrative within the Old Testament which informed the authors of Isaiah and Micah. It is appealing then to extrapolate this story internationally and over time through various historical turning points where we believe we have taken major steps towards a settled and peaceful international system: Augsburg-Westphalia-Vienna-Versailles-San Francisco. In addition to seeing these comforting continuities another very human foible is placing significance on evidence of divination. This too has ancient roots. The book of Deuteronomy explains that God will only speak to us through prophets and we will be able to tell true prophets from false prophets by the accuracy of their predictions (18:22). By that score Isaiah is exalted among the prophets as he is seen by Christians as foretelling the virgin birth of a Messiah and in his story of the servant in chapters 52 and 53 he introduces the idea of an innocent person whose suffering substitutes for the suffering of the guilty, thus presaging the image of Jesus as the Lamb of God. The description in Isaiah 2:4 and the two verses preceding it of a world without war or weapons, ruled by justice, can also be seen as prescient: his vision of many nations (but not a world government), of a global court where nations settle their disputes, systematic disarmament, and where peace is not merely the aftermath of a cataclysmic war but comes from “instruction” could be said to look a lot like the UN system. Seeing ourselves as the culmination of a series of historical progressions is enticing enough, but how much more inspiring to be the fulfilment of an ancient prophecy. Look at what happened with the names given to the Vuchetich statue. By moving from Isaiah’s third person (“They shall…”) to the first person (“We shall…”, “Let us…”) the UN becomes not just inspired by Isaiah as per Hammarskjold’s remarks but sees itself as parts of its fulfilment. This arguably makes it harder to debate alternative visions of world order or pathways to a peaceful order, since such arguments can be treated as sacrilege, or as hypocritical if advanced by Christian scholars or political leaders. This seems to favour one half of the Atlantic Charter’s plea over another – spiritual reasons trumping the reality that Isaiah’s vision is still some way off. Invocations of universal values backed by ancient wisdom alert us to the presence of a type of kitsch. The Vuchetich statue, representing official Soviet state art, combines artistic and political kitsch – it is hard to believe that the artist believed in the sentiment since his apparent aversion to swords didn’t prevent him putting a 33 metre long sword into the hand of his most famous creation, the colossal “The Motherland Calls” statue in Volgograd. (Brian Urquhart also claims that the Expo ’58 statue was disparagingly known as “Mr Muscles” within the UN.) Expo ‘58 itself was also an example of wishful thinking – symbolised by an atom which is not only peaceful but even becomes an theme park attraction and beacon for lost children (recall Kundera’s description of kitsch as “setting up a folding screen to curtain off death”). The phrase “swords into plowshares” has cropped up in political speeches by Eisenhower, Reagan, and Monachem Begin all trying to demonstrate their peace-loving credentials, and, to seal its place in the kitsch hall of fame, it shows up in Michael Jackson’s “Heal the World”. 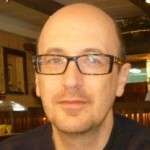 In his address to the inaugural meeting of the European Society of International Law, Martti Koskenniemi said “the distinction between kitsch and non-kitsch is also the same as that between false and genuine universalism”. The way to overcome this prophetic kitsch is to recognize that far from being universal, “swords into plowshares” is but one takeaway from an ancient prophesy. There are alternative ways to lay claim to Isaiah’s vision, not all of which are pacifist: as with other Biblical prophetic works Isaiah also features many passages predicting a crushing and eternal military victory of Israel over her rivals; Chapter 45 contains a paean to the benefits of enlightened colonial rulers; and the book as a whole could arguably be seen as having a greater focus on social justice than on disarmament. 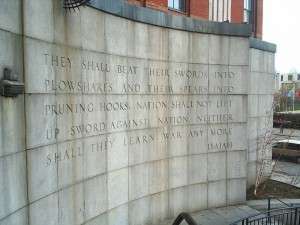 Even the “swords into plowshares” verse leaves open multiple routes to that peaceful future, including relaxing rules on the use of force so as to fight a few more wars before we feel secure enough to renounce force altogether (for a while at least). Invoking Isaiah is undoubtedly well-intentioned, but in scholarly discourse it also carries the danger that we don’t just hear an echo, we create an echo chamber.